To facilitate global comparisons with the United States, this survey includes many of the core questions from the World Internet Project, as well as surveys conducted by Pew Research Center, Gallup, and other syndicated sources. Collaboration with Harris Poll to include some of the Media Use in the Middle East questions in an April 2017 survey in the United States expands the the scope of questions even further to draw comparisons between the Arab world and their American counterparts. When U.S. data were only available for 2015, comparisons to the Arab world are made by using the 2015 Media Use in the Middle East survey. All Middle East data reported in this chapter are among nationals only. The “right direction/wrong track” question is a long-standing, general measure of public perception of the well-being of one’s country. Nearly all nationals in the Gulf states say their country is headed in the right direction (97% UAE, 95% Qatar, 94% KSA). Tunisians and Jordanians are optimistic as well (right direction: 72% Tunisia, 64% Jordan). Fewer than four in 10 Americans and Lebanese, however, feel their country is headed in the right direction (38% U.S., 39% Lebanon; U.S. data: Real Clear Politics, 2017). Optimism increased steadily among nationals in Lebanon and Tunisia (right direction: Lebanon: 14% in 2013 vs. 24% in 2015 vs. 39% in 2017; Tunisia: 27% in 2013 vs. 42% in 2015 vs. 72% in 2017). “Right direction” sentiment in Saudi Arabia sharply increased since 2015 (67% 2015 vs. 95% in 2017). Optimism that the UAE is headed in the right direction continues to be very strong among a large majority of Emiratis (87% in 2013 vs. 95% in 2015 vs. 97% in 2017). Jordanians remain steady at about two-thirds expressing such optimism (69% in 2013 vs. 64% in 2017). In comparison, optimism in the U.S. remains below 40% (right direction: 34% in 2013 vs. 31% in 2015 vs. 38% in 2017; U.S. data: Real Clear Politics, 2013, 2015, 2017). 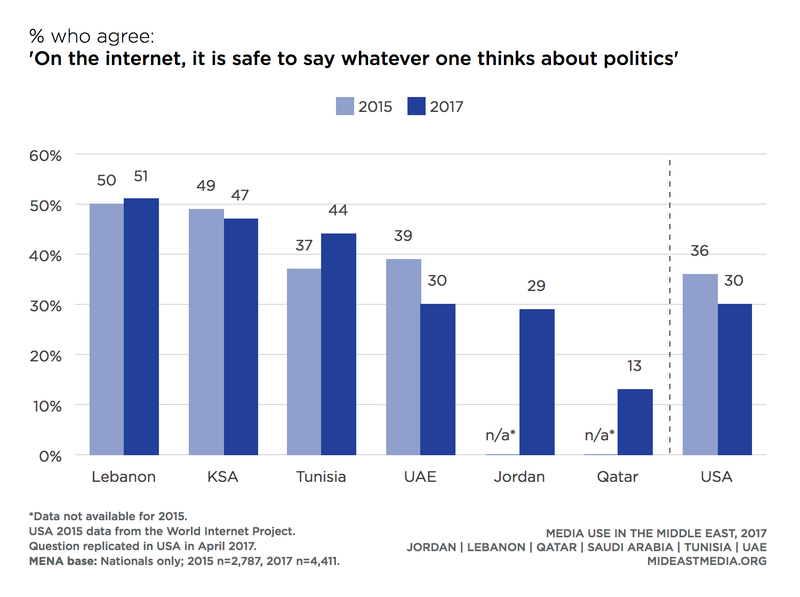 Respondents were asked whether they agree or disagree that “on the internet, is it safe to say whatever one thinks about politics.” Across the region, only four in 10 Arab nationals feel it is safe to talk about politics online, with no more than half in any country agreeing. 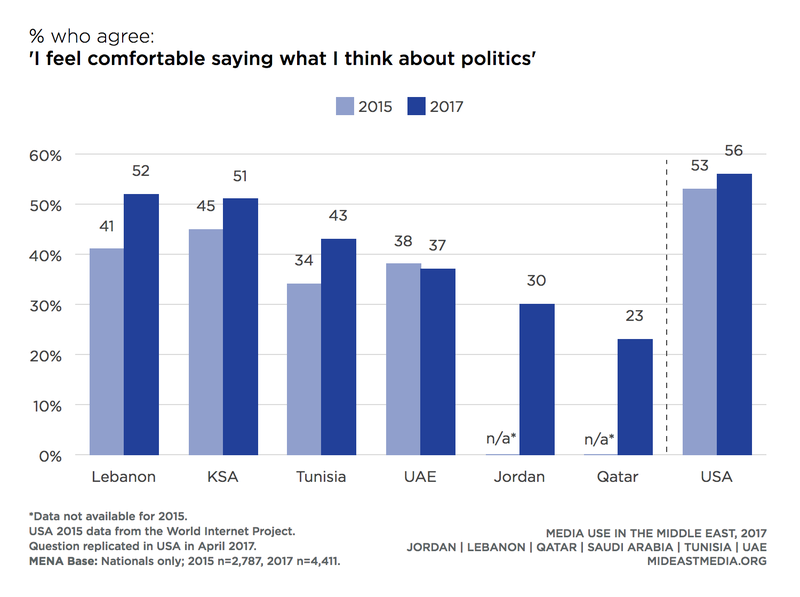 Nationals in Lebanon, Saudi Arabia, and Tunisia are the most likely to feel it is safe to speak out about politics online and Qataris the least likely (51% Lebanon, 47% KSA, 44% Tunisia vs. 13% Qatar). Americans are somewhat circumspect and similar to Jordanians and Emiratis in their responses, with three in 10 agreeing it is safe to talk about politics online (30% U.S., 30% UAE, 29% Jordan; U.S. data: Harris Poll, 2017). 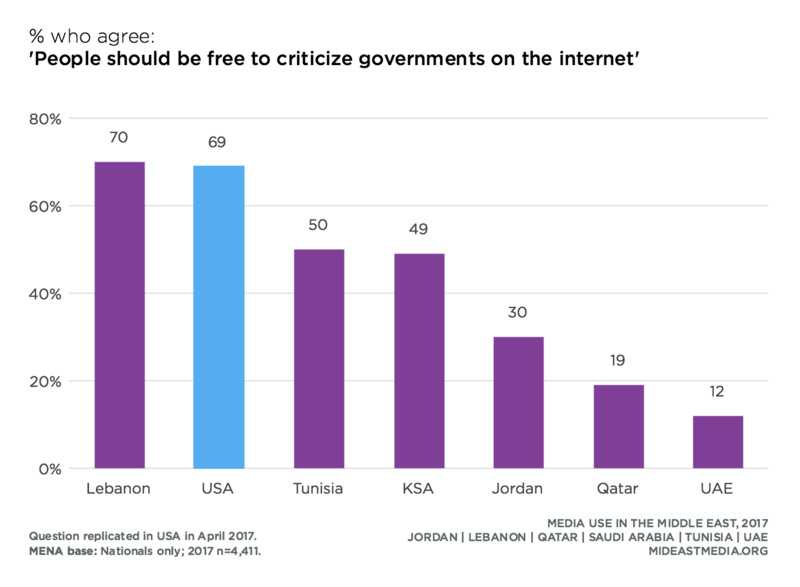 Seven in 10 Americans and Lebanese believe people should be free to criticize government on the internet (69% U.S., 70% Lebanon; US data: Harris Poll, 2017). In comparison, fewer than one in five Qataris and Emiratis agree (19% Qatar, 12% UAE). Tunisians, Saudis, and Jordanians fall in the middle (50% Tunisia, 49% KSA, 30% Jordan). 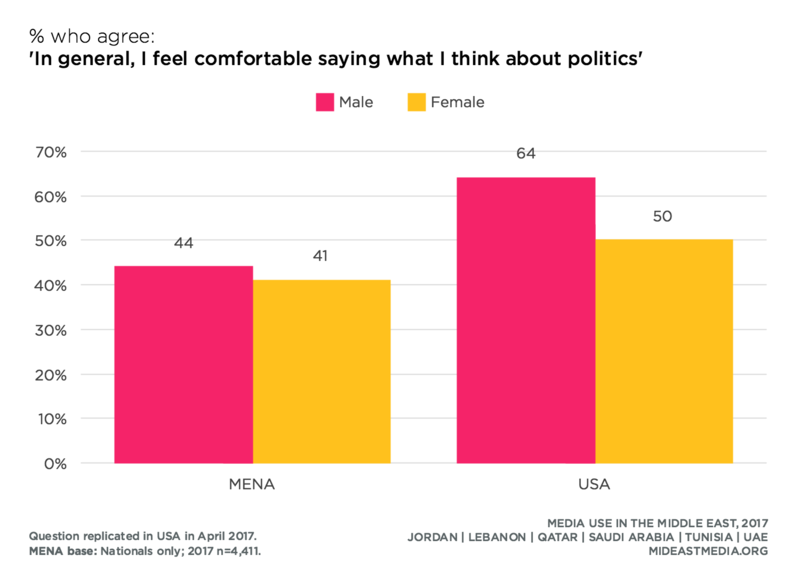 More than half of Americans, Lebanese, and Saudis feel comfortable voicing their political opinions (56% U.S., 52% Lebanon, 51% KSA; U.S. data: Harris Poll, 2017). Four in 10 Tunisians and Emiratis feel comfortable speaking about politics, while fewer Jordanians and Qataris agree (43% Tunisia, 37% UAE vs. 30% Jordan, 23% Qatar). Many internet users in the region feel they can increase their political influence by using the internet. Saudis more than other Arab nationals are likely to perceive greater political influence online, while Emiratis are the least likely to say the same (2015: 53% KSA, 19% UAE). 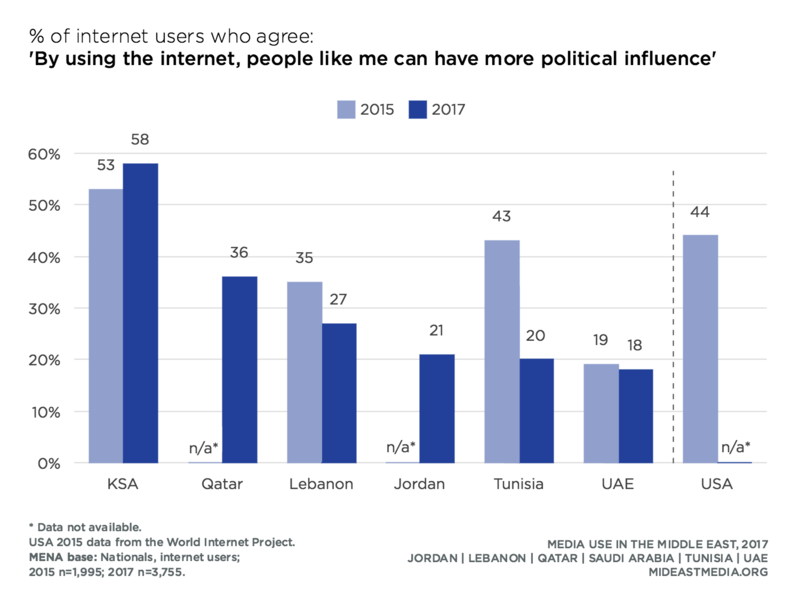 Just under one-half of U.S. internet users think they can have more political influence online, similar to the share of Tunisians and more than nationals in Lebanon (2015: 44% U.S., 43% Tunisia, 35% Lebanon; U.S. data: World Internet Project, 2015). Views about the topics people should be able to discuss publicly vary widely by country. Two-thirds of Lebanese and one-half of Tunisians think people should be able to publicly criticize the government’s policies, while those in the Gulf states are much less likely to agree (2017: 66% Lebanon, 48% Tunisia vs. 27% KSA, 21% Qatar, 14% UAE). In comparison, nearly all Americans believe in the freedom of people to publicly criticize the government’s policies (2015: 95%; U.S. data: Pew Research Center, 2015). Very few Arab nationals, though, believe people should be able to make public statements offensive to their religion or beliefs or offensive to minority groups (2017: 15% religion/beliefs, 17% minority groups). Saudis and Tunisians are twice as likely as nationals from other Arab countries to support this form of free speech, but the rate remains low at only one in five in these countries (2017: religion/beliefs: 23% KSA, 20% Tunisia vs. 11% UAE, 9% Lebanon, 3% Qatar; minority groups: 25% KSA, 21% Tunisia vs. 12% UAE, 12% Lebanon, 6% Qatar). While Americans may not agree with statements that are offensive to their religion or beliefs or to minority groups, most still support people’s right to make these statements publicly (2015: religion/beliefs: 77%; minority groups: 67%; U.S. data: Pew Research Center, 2015). Concern about online surveillance is much more common among U.S. internet users than for those in the Arab countries in this study. 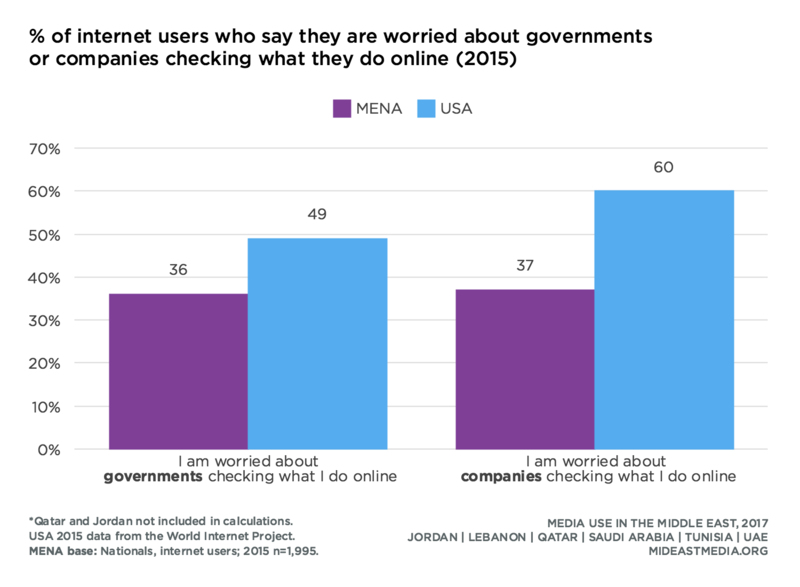 One-half of U.S. internet users, compared with one-third of Arab internet, users worry about government checking what they do online (2015: 36% Middle East vs. 49% U.S; U.S. data: World Internet Project, 2015). Six in 10 U.S. internet users, compared with just one-third in Arab states, worry about companies monitoring their online activity (2015: 37% Middle East vs. 60% U.S.; U.S. data: World Internet Project, 2015). More Emiratis than other Arab nationals say media in their country can report news independently without interference from officials. Six in 10 Emiratis agree their media is independent, as do one-half of Saudis and Americans (60% UAE, 49% KSA, 50% U.S.; U.S. data: Harris Poll, 2017). 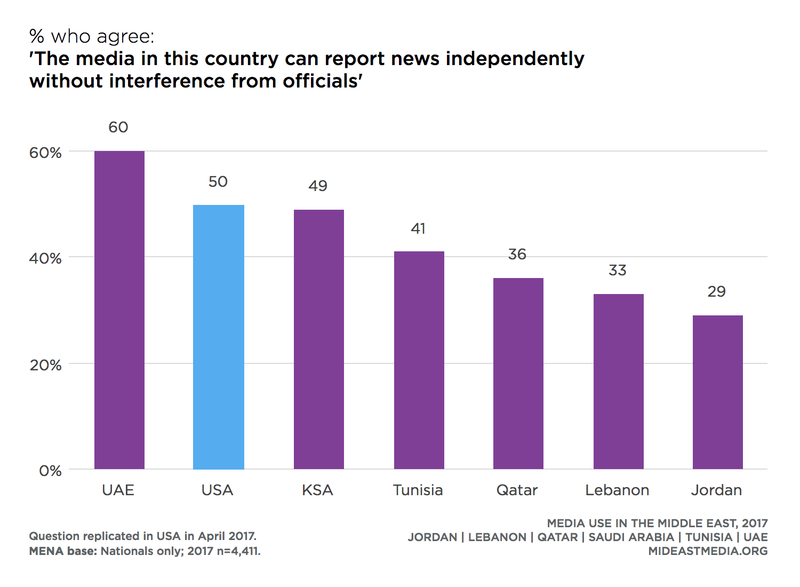 In comparison, only one-third of nationals in Qatar, Lebanon, and Jordan feel media in their respective countries are free from official interference (36% Qatar, 33% Lebanon, 29% Jordan). Distrust of mass media to report the news fully, accurately, and fairly is much more common among Americans than Arab nationals. 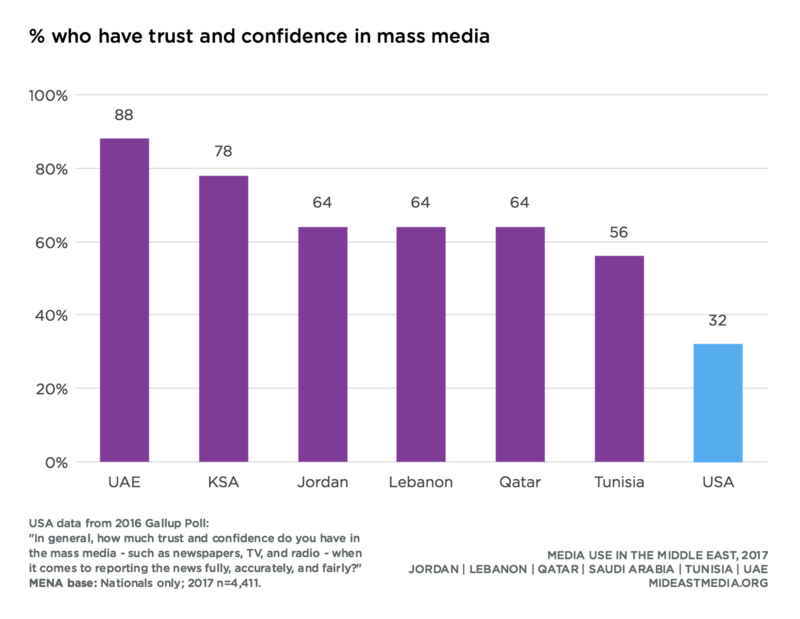 In a 2016 Gallup poll, just 32% of Americans said they trust the mass media compared with two-thirds or more in Jordan, Lebanon, Qatar, Saudi Arabia, and the UAE, and 58% in Tunisia (U.S. data: Gallup, 2016). 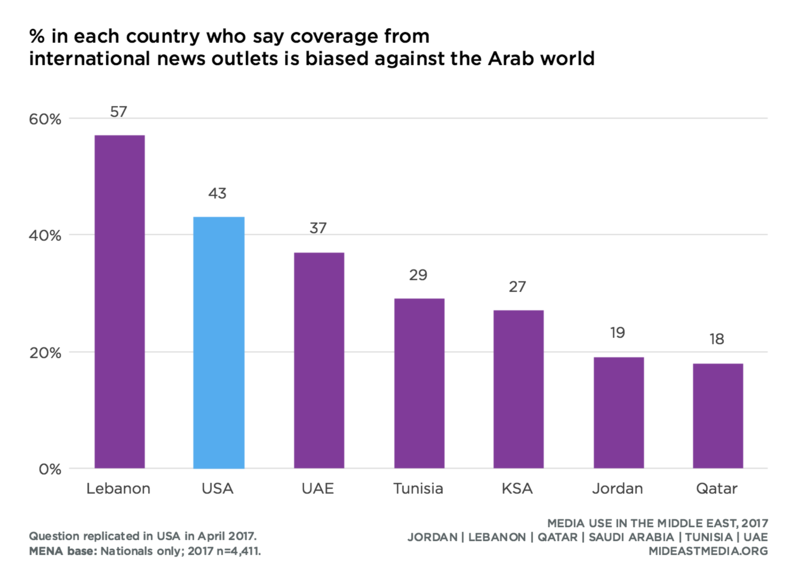 Respondents were asked if they thought international news organizations’ coverage was biased against the Arab world, biased in favor of the Arab world, or if coverage was fair. Four in 10 Americans think international news is biased against the Arab world with only Lebanese more likely to perceive such bias (57% Lebanon, 43% U.S.; U.S. data: Harris Poll, 2017). 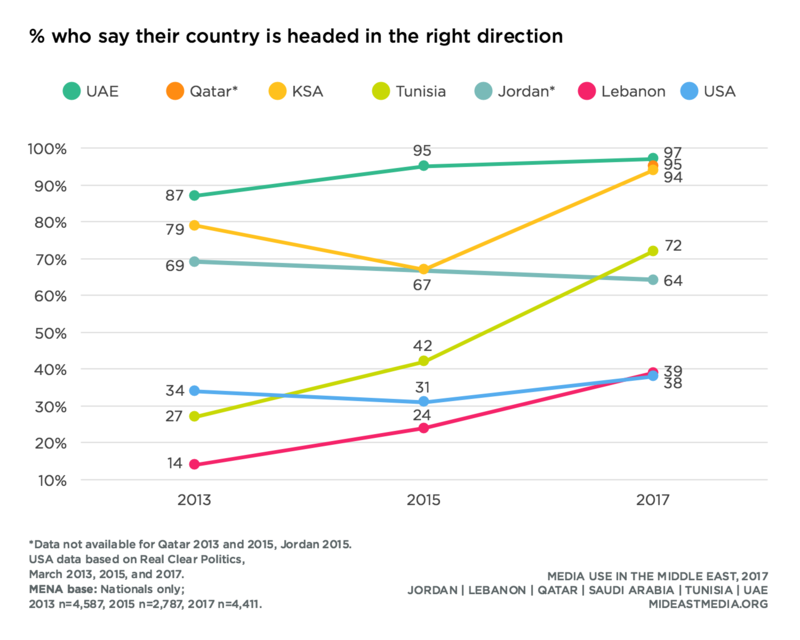 Less than one in five in Jordan and Qatar feel international coverage is biased against the Arab world (19% Jordan, 18% Qatar). One-quarter to one-third of nationals in each the UAE, Tunisia, and Saudi Arabia perceive bias against the Arab world in international news (37% UAE, 29% Tunisia, 27% KSA). Nearly nine in 10 Americans use the internet, similar to the rates observed in Lebanon, Qatar, and Saudi Arabia (88% U.S., 95% Qatar, 91% Lebanon, 91% KSA; U.S. data: Pew Research Center, 2017a). 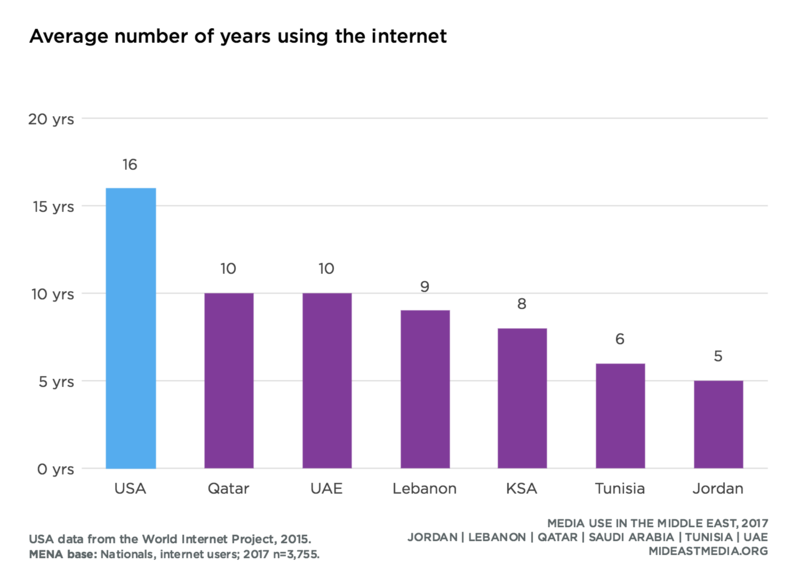 In comparison, nearly 100% of Emiratis use the internet, while fewer are online in Jordan and Tunisia (99% UAE vs. 80% Jordan, 68% Tunisia). Smartphone ownership is more prevalent in the Middle East than in the U.S. Nearly all nationals in Lebanon, Qatar, Saudi Arabia, and the UAE own a smartphone and nearly as many Jordanians (91% Lebanon, 93% KSA, 95% Qatar, 99% UAE, 83% Jordan). In comparison, only 77% of Americans own a smartphone (Pew Research Center, 2017a); only Tunisians own smartphones at a lower rate (65%). However, computers (laptops and desktops) are much more common in the U.S. than in the Arab region. Three in four Americans use a computer (78%; U.S. data: Pew Research Center, 2017a) compared to about one-half or less in the Arab countries surveyed (55% UAE, 52% KSA, 48% Qatar, 38% Tunisia, 27% Lebanon, 11% Jordan). Tablets—owned by one-half of Americans—are also much more common in the U.S. than the Arab countries in this study (51% U.S. vs. 37% UAE, 36% KSA, 19% Tunisia, 18% Qatar, 15% Lebanon, 3% Jordan; U.S. data: Pew Research Center, 2017a). Use of e-readers is relatively low across the board. About one in five use an e-reader in the U.S. and Saudi Arabia, while penetration is much lower in the other countries (22% U.S., 17% KSA vs. 10% UAE, 9% Tunisia, 3% Lebanon, 2% Qatar, 1% Jordan; U.S. data: Pew Research Center, 2017a). Facebook penetration among Americans is similar to that of nationals in Jordan, Lebanon, and the UAE; about seven in 10 use Facebook in these countries (68% U.S., 70% Jordan, 70% UAE, 77% Lebanon; U.S. data: Pew Research Center, 2017b). Just over one-half use Facebook in Saudi Arabia and Tunisia, while only one-quarter of Qataris use Facebook (55% KSA, 57% Tunisia, 22% Qatar). Instagram is popular in Qatar and the UAE with two-thirds using this platform (66% Qatar, 57% UAE). Four in 10 are on Instagram in Saudi Arabia, while much fewer use Instagram in Lebanon, Tunisia, Jordan—and the U.S. (32% Lebanon, 23% Tunisia, 21% Jordan, 28% U.S.; U.S. data: Pew Research Center, 2017b). Just under one-half of nationals in the Gulf states use Twitter (47% KSA, 45% Qatar, 43% UAE), which is double the rate of Americans (21%; U.S. data: Pew Research Center, 2017b). Twitter is much less common among nationals in the other Arab countries (13% Lebanon, 9% Jordan, 8% Tunisia). One-quarter of Americans are on LinkedIn (Pew Research Center, 2017b), but this site has yet to gain traction in the Middle East. LinkedIn has no more than 5% penetration in any of the Arab countries surveyed. Internet users in the U.S. use email at much higher rates than those in the Middle East. Eighty-five percent of internet users in the U.S. check email every day compared to only three in 10 in the Middle East (85% U.S. vs. 30% Middle East; U.S. data: Statista, 2017). 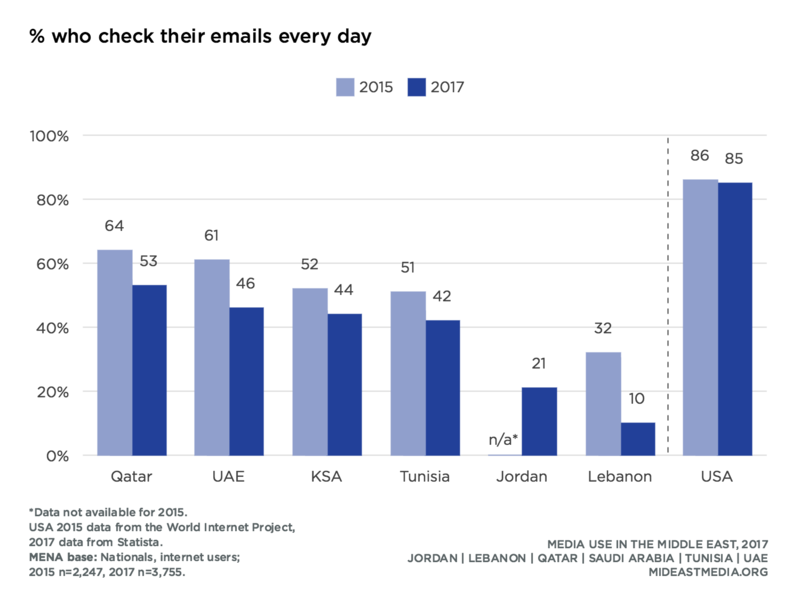 There has been a sharp decrease in daily email use among Arab internet users, from 52% in 2013 to 30% in 2017. 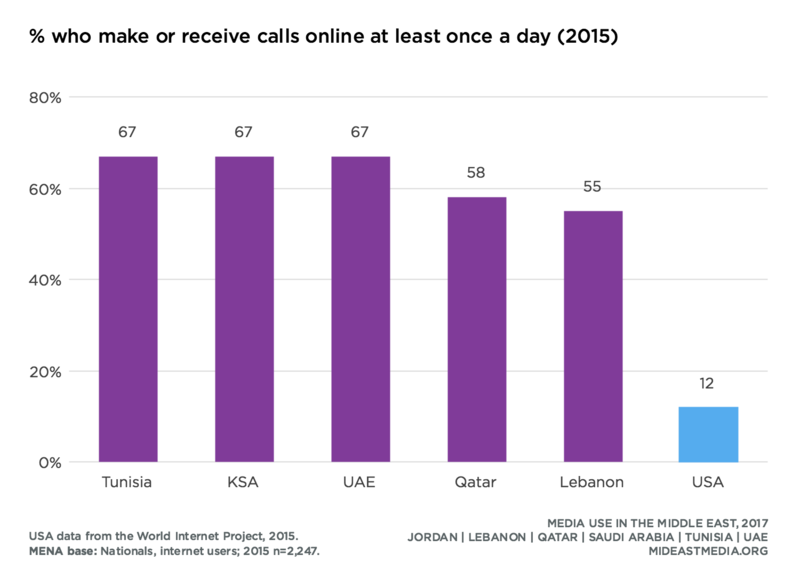 In comparison, Arab internet users are five times more likely than Americans to make or receive calls via the internet on a daily basis (2015: 62% Arab regional average vs.12% U.S.; U.S. data: World Internet Project, 2015). And VoIP use has grown in the Middle East over the past two years, with seven in 10 making or receiving calls online daily in 2017. Daily use of the internet for calls has skyrocketed in Lebanon from 55% in 2015 to 91% in 2017. American and Arab internet users are equally likely to get news online on a daily basis (2015: 53% Middle East vs. 48% U.S.; U.S. data: Word Internet Project, 2015). Yet those in Arab countries are four times as likely to search the internet for health and religious information every day (2015: health: 26% Middle East vs. 9% U.S; religious/spiritual: 27% Middle East vs. 6% U.S; U.S. data: World Internet Project, 2015). Qataris are by far the most likely to search for health and religious information every day (55% health, 57% religious/spiritual). American and Arab internet users use the internet for music and games at similar rates. About one-third download or listen to music and play games online every day (2015: music: 36% Middle East vs. 31% U.S.; games: 35% Middle East vs. 32% U.S.; U.S. data: World Internet Project, 2015). 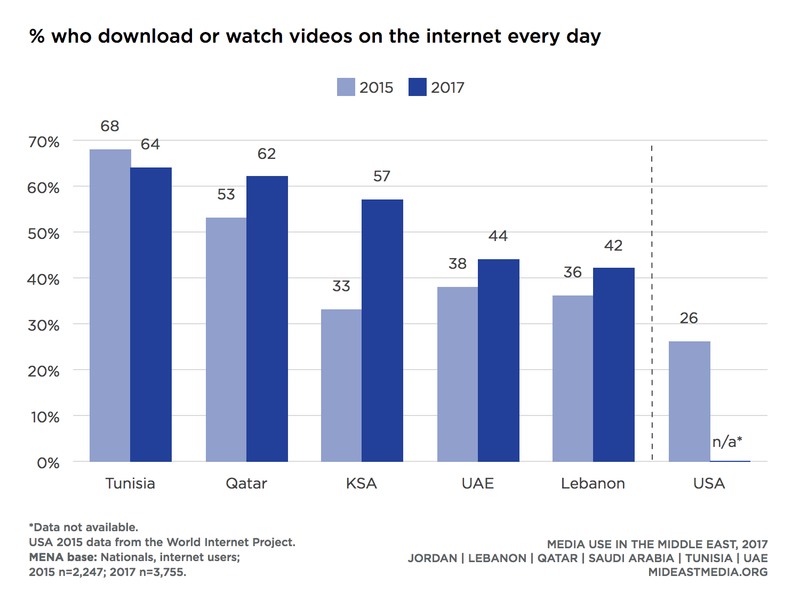 In comparison, internet users in Arab countries are more likely to download or watch videos daily (2015: 43% Middle East vs. 26% U.S.; U.S. data: World Internet Project, 2015). Internet users in Arab countries seem to be more avid users of social media than American internet users; they are nearly twice as likely as internet users in the U.S. to post messages or comment on social media every day or to re-post content from other people daily (2015: social media post/comment: 64% Middle East vs. 32% U.S; re-post others’ content: 53% Middle East vs. 29% U.S; U.S. data: World Internet Project, 2015).